Alex Rodriguez explained after yesterday's game that, when he hit his go-ahead two-run homer in the eighth inning yesterday, he thought he'd ended the game, because he'd thought it was the ninth inning. Only after he noticed his teammates still positioned inside the dugout did he realize they still had a half-inning to play. It's a funny little story that punctuated a day on which they salvaged the last game of the series and got CC Sabathia his tenth victory of the year. It allows the Yankees to enter their Independence Day — and Canada Day! — weekend series against Toronto in good spirits. Because if not for that home run — or some comparably clutch hit — perhaps they don't win yesterday's game. Meaning they'd have been swept by a last-place team. Meaning a Jorge Posada passed ball would have contributed to the loss and helped cost Sabathia the victory. That's no way to enter a holiday weekend. And now they don't have to. There's even the guarded optimism of A.J. Burnett's start this afternoon, his first since Dave Eiland returned to the team. 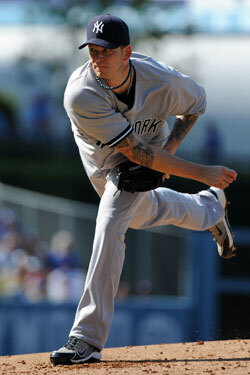 In Eiland's absence, Burnett turned in, statistically, the worst month of any Yankees' starting pitcher, ever. Realistically, it's hard to imagine that a healthy Burnett could stay that bad for much longer, and his struggles aren't entirely a result of Eiland's absence. But if Eiland, in just a couple of days, can correct some mechanical flaws, say "shazam!" and transform him back into a front-of-the-rotation pitcher, he should consider demanding a raise.